We Californians who have the drought fresh in our recent memory hope for another rainy winter. Not too much at once, but enough to keep the reservoirs full and to decrease panic associated with an inadequate water supply. For our dogs a wet winter means a little more vigilance to watch for an infectious spirochete that can cause serious health issues. Cat owners have little to worry about with this disease. Although it has been documented, it is very rare for cats to contract it thanks to their hypervigilant immune system. Leptospirosis has a variety of strains and the L in the DHLPPa combination vaccine is intended to prevent infection. DHLPPa is the abbreviation for distemper, hepatitis, leptospirosis, parainfluenza and parvovirus. It is the most common part of the vaccine to cause a negative side-effect reaction and when first developed it only prevented infection caused by two of the most common strains or serovars. Now the updated vaccine has up to 4 serovars included, yet even that does not cover all of those that may cause disease. Pets who love water play and who spend time in standing water or in rivers and who have significant contact with horses, rats or pigs have a higher likelihood of being exposed. Staff members and Dr. Burtch draw the blood from the back of the elephant’s ear. If your dog loves to wade through water or you take him to the barn or you have rats in your backyard, be aware that as the rains come these bacteria are transmitted via the urine of an infected animal and may be transmitted through the skin or in oral cavities. You can read more about the disease and its clinical signs here. Years ago, Dr. Ann Gratzek, a veterinary ophthalmology specialist, consulted with me on a case at the Vision Quest ranch park. She found uveitis (inflammation in the eye) in an elephant and needed to determine the cause of the disease and recommend treatment. I went to the facility to help obtain a sterile blood sample from the elephant to culture the blood for bacteria. 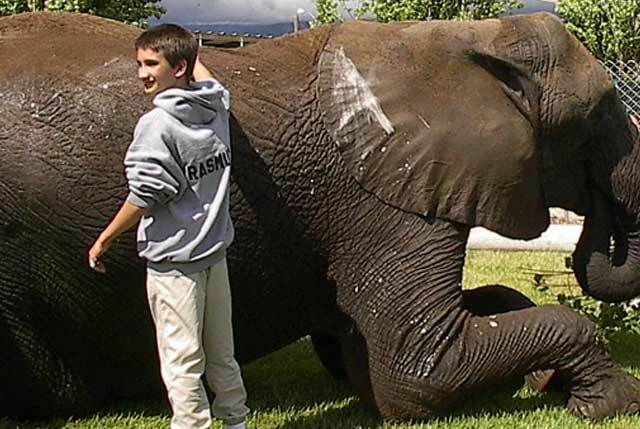 While there the trainer shared that this particular elephant had become very close friends with a zebra who had recently arrived at the facility. Based on suspicion of possible transmission of leptospirosis via the nuzzling trunk of the elephant eating hay and other foods from the floor of a paddock shared with the zebra, we also ran a leptospirosis test on the blood from this elephant. It was positive and we found the source of the eye inflammation and were able to treat and cure the infection.